Elderwood Academy, like many young entrepreneurial companies, has its roots in the makerspace movement. 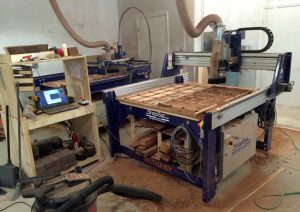 When Quentin Weir and Dan Reiss fulfilled the orders for their first successful Kickstarter campaign, the two CNC machines required– a ShopBot PRS 4×8 and Epilogue Laser– were easily accessible at their local makerspace. And when they launched their second successful Kickstarter campaign, they decided it was time to invest in their own CNC systems. But let’s back up a bit. What is Elderwood Academy and how were they able to launch two successful Kickstarter campaigns in 2 years, the second of which received $280,000 from an initial request of $5000? 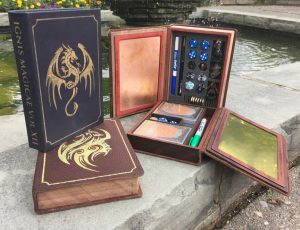 Quentin and Dan use CNC and traditional methods to create their products: An old foil embosser was purchased to give the Spellbooks that extra touch of personalization. Quentin and Dan met through the ‘gaming world,’ role-playing games, such as Dungeons and Dragons (D&D), and board games. At the time, Dan was in medical school at the University of Michigan and Quentin, who had majored in biomedical engineering, was working at UMTRI (University of Michigan Transportation Research Institute) where he prototyped and built research equipment. Dan asked Quentin to prototype a project he was working on, so Quentin showed him Maker Works, a makerspace in Ann Arbor, MI, which had all the equipment needed including a ShopBot PRS 4’x8’. Dan was blown away by how financially accessible CNC equipment suddenly became. Quentin reflects, “Pairing shop skills with my engineering degree set me up to where I am right now… and my experience with mentoring FIRST Robotics. 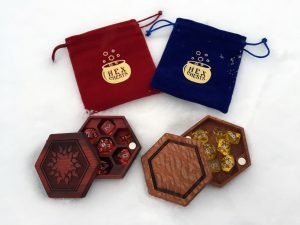 I learned the CNC at Maker Works.” It was then that Dan showed Quentin his “Hex Chest” idea, a decorative container for carrying gaming dice, which became their first product successfully funded on Kickstarter. Using a PRS 4’x8’ Standard and an Epilogue Laser, they tapped into a niche market that sought individuality. Both tools easily met this demand for customization. They got featured a few times, which boosted their audience. Creating two new dust feet allowed for interchangeability not only between their PRS and PRT but also for their various products. “Pretty much all sports have something. If you want to buy $200 basketball shoes, you can do that,” says Quentin. But the world of gaming is different. As Quentin explains it, a lot of gamers are used to carrying their items around in bags or Tupperware containers. This includes dice, playing cards, a pen for tallying points, a miniature that represents one’s character, and coins—a lot of small pieces. Quentin and Dan understand this culture’s obsession with uniqueness: gamers thrive on their ability to create their own character and nuanced worlds. Elderwood Academy complements this need for self-expression by creating functional objects that bring a level of professionalism to the gaming world. 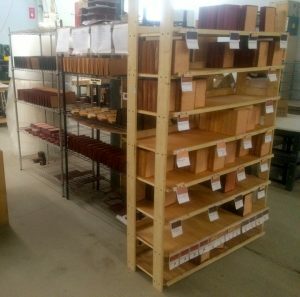 After launching a second Kickstarter to create Spellbooks, they purchased their own CNC machines. “We didn’t bother looking at other CNC routers. 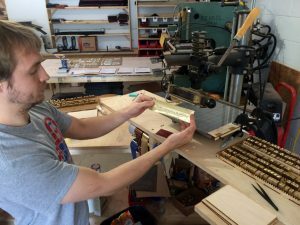 We knew ShopBot could handle the volume while allowing for the customization we required,” says Quentin. They already knew VCarve Pro and how to modify the SB3 software to suit their needs. It gained them another employee that could work 24/7—though it wasn’t a smooth transition. They are currently updating their dust collection system, so ignore the wood chips! Quentin and Dan purchased a used PRT 4’x4’ from University of Michigan’s Property Disposition that came with no background history. Its controller ended up having a failed repair, and it was missing the proximity switches and dust collection. Quentin struggled to fix it until he realized it was just a ‘big robot.’ Drawing on his FIRST Robotics experience he got it moving, but not before purchasing a new ShopBot PRS 4’x4’, too. “We launched the second campaign before we nailed down our production process. I was still in the prototyping phase. We learned our lesson,” Quentin states. With so many customizable features, they had to figure out a solution. Quentin set up a server that stores all the variations in cutting files, which means there are a lot of files. Just look at their website and see all of the options to choose from! If small edits are made to fine tune a file, it automatically gets re-uploaded into a software program he wrote located on the computer running both ShopBots. Their machinist can walk up to the computer, select the features for a customer’s order, and the program opens the correct SB3 files. Previously working at the makerspace, they also had trouble with ‘missing comm errors’ because of static, and kept throwing out half-completed projects. One solution was to take advantage of SB3’s editing capabilities: They wrote their own header and set up the code so each project gets fully pocketed/cut before moving on to the next one on the jig setup. 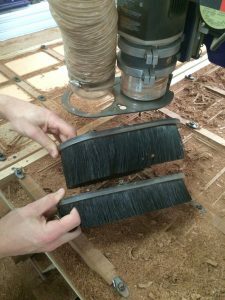 They can machine 40 complete Hex Chests in about 5 hours while completing other tasks. 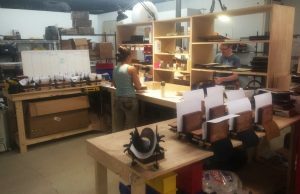 Because the final steps in making a Spellbook involves hands-assembly, their 2 ShopBots and Trotec laser enable them to deliver a fully personalized product for a fair price in the volume they need. Currently Dan commutes back and forth between Ann Arbor and San Francisco, where he is an internal medicine resident at San Francisco State University, and Quentin divides his time between Elderwood Academy and a board game company he co-owns with another colleague. 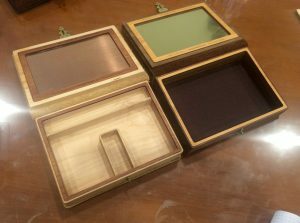 Quentin articulates that the “value a D&D player gets from their own Spellbook… it adds to the charm of the game.” Though not a gamer, having held one of the books in my hands, there’s a conscious craftsmanship to them, from the wood selection to the gold clasp to the foil embossing. It speaks to the success Elderwood Academy has achieved in bringing a heightened professionalism to the gaming community. They have two hand assembly stations and have hired several employees.